Frequent Flyers Aerial Dance hosted the 2018 Aerial Dance Festival (ADF), July 30th through August 10th, in Boulder, Colorado. This year marked the 20th anniversary of the festival coordinated by the artistic director of Frequent Flyers Aerial Dance, Nancy Smith. 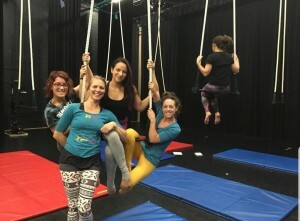 In celebration of the history of aerial dance, the festival offered training for aerialists of generations new and old. Attendees from all over the country came with a variety of backgrounds in dance, circus, theater, entertainment, and acrobatics. The training brought the opportunity for students to learn from master instructors and explore new ways of expressing themselves through the art of movement. The festival offered three-hour long immersion courses, as well as, ninety-minute classes, available Monday through Friday each week. Workshops included Thai Massage, led by Yuki Tsuji, with focus on mobility for the shoulders and thoracic spine, and remedy for hips and low back. Jill Scott provided a workshop entitled, Make-up Fundamentals for the Performer. The wide array of ADF classes had varied focuses of aerial choreography, sequencing, conditioning and injury prevention, partnering, aerial improvisation and exploration, technique, emotion, vocabulary, and artistry. Mixed apparatus work, rope, sling, fabric, trapeze, bungee, lyra, aerial yoga, and handstands provided differing means of training. Big questions being asked within the aerial community were pondered amidst the physical training. What does it mean to be an aerial performer? How can you, as an artist, create personal work and yet still connect to an audience? What do spectators of the aerial arts look for in a performance? Topics such as the longevity of a performer, and how to honor the history of aerial dance, were discussed. Three showcase performances were presented at the Dairy Arts Center, leading into the second week of the ADF. The showcase featured group pieces, choreographed and performed by Frequent Flyers staff and students. The guest instructors were also given the opportunity to perform solo pieces that would reflect their work, and for some, the content that they would be teaching in classes. Students were encouraged to attend an event called, Intimate Encounters, on the first evening of classes. The gathering gave the opportunity for students to listen to each of the instructors/performers processes in creating the choreography for their performance pieces. The instructors/performers shared details about their artistic background, education, and experience in the aerial arts, as well as, previous instructors they studied under, which were for many the inspiration of their work. Each piece of work was unique and original to the performer, while they still came together to create a spectacular show reflecting the heart of humanity. As an attendee of the 2018 festival, I acquired invaluable insight into the aerial arts, gained through each activity practiced within classes. At large, group learning was practiced; however, individual and small group exercises, made training feel intimate. The structure of the festival, in addition to the education received, provided the perfect opportunity for networking and creating connections between studios and individual performers within the aerial community. The aerial dance festival experience is one that every aspiring aerialist should consider adding to their training. ADF will stand in my memory as a growing experience that inspired and compelled me to further explore my career as an aerialist. Brittany Royce is an aerialist based out of Springfield, Missouri. Her passion for acrobatics started at three years old when she first discovered gymnastics. She was a competitive gymnast for ten years and coached gymnastics for seven years. 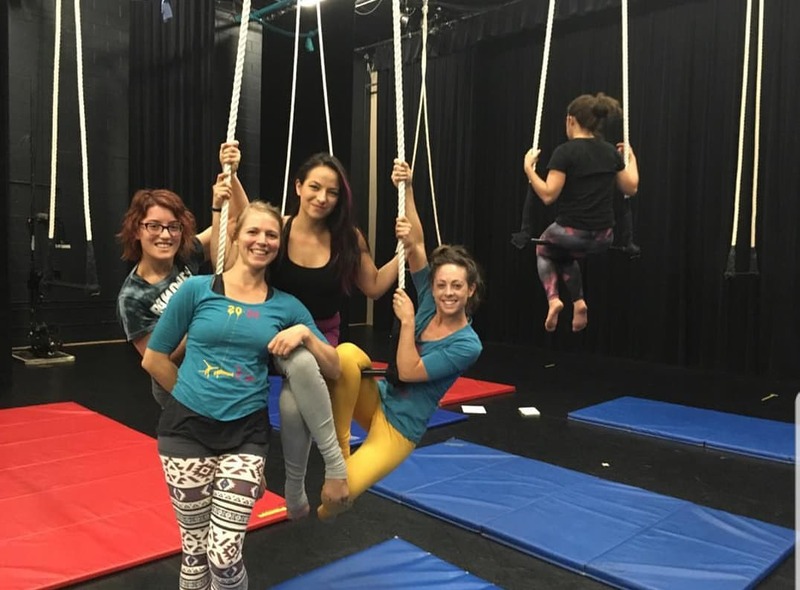 She discovered Aerial Arts in 2013 while living in San Diego and hasn’t stopped learning since. It is an art form that enables her to express her faith and continue pursuing acrobatics in her adult life. 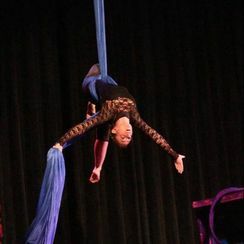 She has recently joined the team at Springfield Aerial Fitness as an instructor for trapeze, tumbling, handstands, and youth classes. Erin Ball has been a member of AerialDancing.com since January 2012. (She is one of our original members!) At that point in time, Erin was like any other aerialist-you know-has all limbs, practices on a variety of aerial apparatuses as well as performs grounded work with yoga and acro partnering. She still does all these things minus the “has all limbs” part, but who needs those anyway? In this article, Ryah Cooley has captured the inspiring story of overcoming.